First cut a 6" x 9 1/2" piece of Stampin' Up! Melon Mambo card stock and fold it in half for the base, a 4 1/2" x 5 3/4" piece of Stampin' Up! Pink Pirouette for the middle layer, a 4 1/4" x 5 1/2" piece of patterned paper for the front layer, a 1 1/2" x 5 1/2" piece of pink glitter paper for the strip, a 3 1/8" x 3 3/8" piece of Melon Mambo for the cupcake's background, a 3" x 3 1/4" piece of white for the cupcakes, a 3/4" x 2 1/2" piece of Melon Mambo for the sentiment's background and a 1/2" x 2 1/4" piece of white for the sentiment. Then adhere the strip of pink glitter paper to the patterned paper, the patterned paper to the middle layer and the middle layer to the base and set aside. 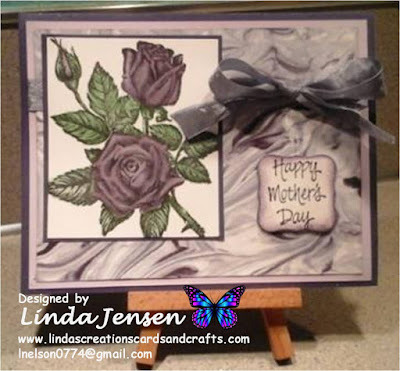 Next sponge the white card stock's edges and stamp the platter in Stampin' Up! Melon Mambo ink. 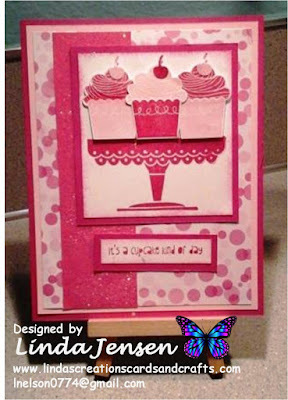 Then stamp the cupcakes in Melon Mambo and Pink Pirouette inks and punch them out with a Stampin' Up! Cupcake Builder punch. Then attach the cupcakes to the platter with mini pop dots. Next sponge the edges of the small piece of white card stock with Melon Mambo ink then stamp the sentiment. Then finish assembling the card and enjoy!